in tireless permutations, a snowy walk leads up the mountainside. 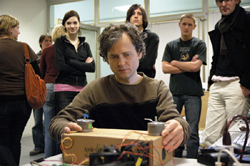 the prototype of a video-sound installation is created in an open studio. 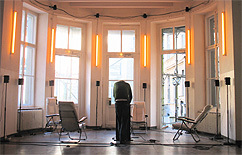 berlin-based musician robert henke is working on a new version of his performative concert-installation atlantic wave terminals, in which visitors can make music together using a visual and acoustic interface. in his sound installation recomputing space, the zurich-based peruvian rodrigo derteano examines the layers of sound and acoustic characteristics of urban space. 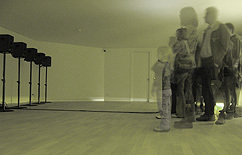 a system of speakers, arranged serially on the floor, plays parallel-connected tracks from multi-channel sound recordings of public squares, fields, or street scenes, all of which merge to form a dense urban soundscape. 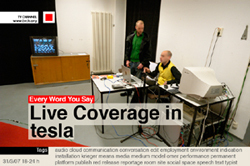 nachdem robert henke während seines open studios im märz eine neue version seiner performativen konzertinstallation atlantic wave terminals entwickelt hat, zeigt tesla jetzt eine version für zwei spieler an zwei orten: im luxemburger museum für moderne kunst [mudam] und im foyer des podewils' schen palais. die installation ermöglicht den spielern, durch ein visuelles interface miteinander zu musizieren.